The most important event in your life needs the best place for it to be held in. Reception halls of Aradana Group of Hotels are made with weddings in the mind. 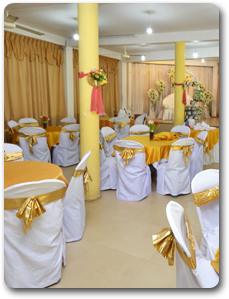 With ample space for your friends and family, it'll be an enjoyable day in our wedding halls for all of them. 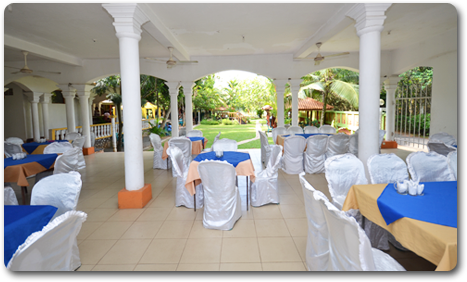 In all our locations, we have a perfectly maintained garden, so that your guests can enjoy outdoors as well. Kids will enjoy the garden too, as we've got enough space for them to play with friends and cousins. Our gardens have nice grass lawns, plants with beautiful flowers, and trees with great shades. This green environment produces a comforting natural freshness. Our halls are open to the garden, so the breeze will bring you the coolness of trees to you. 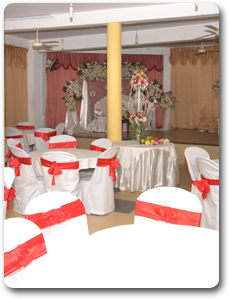 Our staff will decorate the hall in a professional manner with the colors of your choice, making everything pleasant in the eye. We'll decorate comfortable chairs, and tables for your guests with this color too. We have washroom facilities equipped with state of the art bathware, adjacent to the hall, so that should a need arise to anyone of your guests they'll be able to reach the washroom in no time. We have dedicated parking space next to our hall premises beyond the garden, so that you don't have to worry about parking your and friends vehicles somewhere else.